German air raids targeted Great Yarmouth for the first time in summer 1940. Most bombing raids on the town occurred in 1941. 800 high explosive bombs were dropped that year. Some which failed to explode are shown in the photographs. 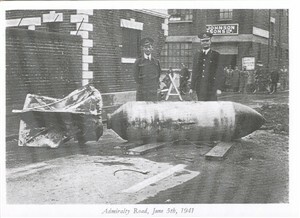 The bomb in Admiralty Road landed near Johnson's Clothing factory in the early hours of June 5. The 4000-pound bomb which fell in Fredrick Road, Gorleston on June 12 was one of three in a raid which killed the occupants of the Tramway public house. Do you have any memories of these raids, and of the people who took part in the bomb disposal work? This page was added by Paul Douch on 18/06/2007. Does anyone have photo's of the Royal Engineers when they were in Gt. Yarmouth 1940 laying mines on the beach and blowing a gap in the pier? We are placing a plaque in April at the racecourse which is near to where my Dad's brother and two more Royal Engineers were killed. The plaque will also remember the Royal Norfolk's who were killed along that stretch of beach. I would like to have placed a photo with the Memorial Plaque. would be most grateful if anyone can help. I am looking for info on sappers from Great Yarmouth during 1941. My grandad was William Stephen Robert Smith aka Bob 1888814. 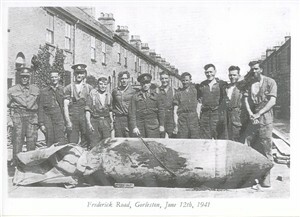 My husbands grandmother died from the last bomb dropped in Great Yarmouth. She was staying in her son's house on Caister road, sitting at the kitchen table at the time.Any info or pictures would be a great help as this is all we know at the moment. I totally agree with Colin Stott's description of a daylight raid over Gorleston. I lived in Middleton Rd and watched as a Junkers twin engined job dropped a bomb which landed about 10 feet from our front door. Luckily it didn't go off. I saw the bomb coming right at me and got indoors in a hurry and stood with my back to the wall wondering what to do, as I didn't want to alarm my Mum who was in the kitchen preparing what we laughingly called "our Sunday roast" (about the size of a baseball, for four people!). Almost immediately there was a great banging on the front door, as though someone was trying to break the door down - it was an ARP warden yelling at us to get out fast as there was an unexploded bomb in the garden! That man deserves a V.C. - if only I could find him.